According to the ACT, 20% of high school students graduate high school without knowing what they would like to major in during college. I was a part of the one-fifth of high school graduates who have no idea what they would like to study or have a career in. I remember being completely overwhelmed in middle and high school when someone asked me what I wanted to do with my life. I’m about to graduate college and am still overwhelmed by the many possibilities. There is a lot of pressure on kids today to plan their education and career at a young age. I went into college without declaring a major because I still had no idea what I enjoyed the most. I always felt like I should have figured it out by the time I applied to college. I had friends who knew they wanted to be a doctor or study computer science since early high school. I ended up feeling behind. Luckily for me, my high school offered many opportunities to research different careers, including through Naviance. By taking the career interest profile, I knew that I wanted to be in a job with a social aspect and that involved working and communicating with a lot of different people. I also scored high in the investigative and conventional categories, which helped me to determine that I like thinking through problems and creating solutions, but also enjoy a structured setting. I had always enjoyed writing in high school, and figured that I would take some courses during my freshman year of college that aligned with my love of writing and the strengths and interests that I discovered through Naviance’s career interest profiler. I stumbled upon a communications introduction class, and absolutely loved it. It aligned with everything I enjoy; writing, editing, and interacting with people in many ways. I declared my public relations major before I took another communications class. I went from feeling entirely lost about what I wanted to do in my life, to someone that was confident in their choice to study and pursue a career in communications in only a year. 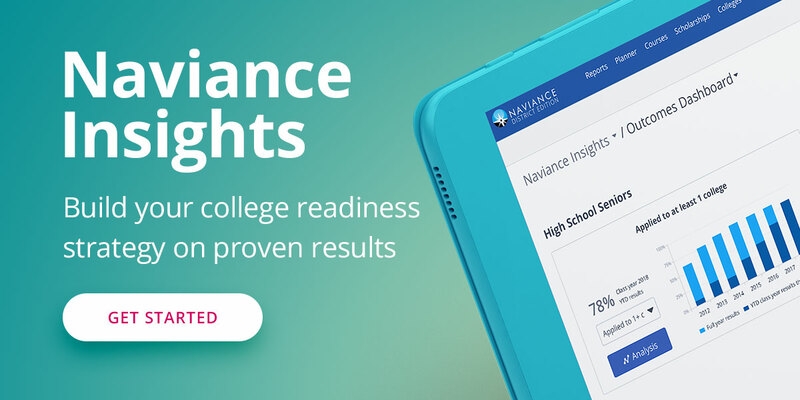 More than anything, I credit Naviance with providing me the opportunity to put into words what my interests and skills were, and to help me realize how those interests and skills fit together. Over the summer, I had the privilege of working for Hobsons, as the marketing intern. Within this role, Naviance has helped me even more to define my career goals and fine-tune my skills within communication and marketing. I look forward to what the future holds, and am glad Naviance played a role.